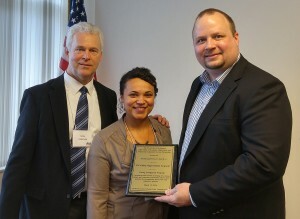 On March 8th and 9th, the Minnesota Head Start Association held their quarterly meeting in St. Paul. Angie Lindseth, President Head Start/Early Head Start Policy Council, Parent Affiliate, Andy Nissen, Vice President Head Start/Early Head Start Policy Council, Parent Affiliate, Tara Morrison, Program Area Specialist, Staff Affiliate, Laurie Coleman, Head Start Child and Family Program Director, Director Affiliate, all attended the event. Denny DeMers, former CEO of Tri-Valley Opportunity Council, Inc., also attended the event and got voted in as a Friend of the Director Affiliate. On March 9th, MHSA held their annual Head Start Heroes event to honor members of the Minnesota Head Start community who overcame tremendous challenges and achieved personal and family success. Our very own, Angie Lindseth, President Head Start/Early Head Start Policy Council, presented an award to one of the recipients this year! The event was held at the Science Museum of Minnesota. Attendees had time to view the Wonder Years, the science of early childhood development, exhibit at the museum as well. Also on the 9th, Yasmina Vinci, Executive Director for the National Head Start Association, held a discussion about the future of Head Start. Specifically, what is happening in Washington D.C. and how Head Start can prepare for the opportunities and challenges that lie ahead. Concluding the two day event, Angie and Andy traveled to the State Capitol to bring Head Start Heroes booklets to legislators’ offices. Eight community initiatives with proven results in moving families toward self-sufficiency received Best Practices Awards last week. Minnesota Community Action Partnership, Minnesota Department of Human Services Office of Economic Opportunity, and the University of Minnesota College of Education and Human Development have partnered for the past 11 years to evaluate and to recognize initiatives that aim to end poverty across Minnesota. The awards go to local Community Action programs that have achieved outstanding and measurable impacts in helping low-income households achieve greater economic self-sufficiency and building partnerships across social service, government and business sectors to better meet the needs of local communities. Tri-Valley’s Caring Companion Program earned the “Promising Practice” Award. The Caring Companion Program consists of companions who are 50 years or older. They help other seniors by visiting with them, taking them to appointments, helping with errands and groceries, playing cards or games, having coffee with them and being a friend to them. Caring Companions can make a difference in the quality of life for a lonely senior. Tri-Valley has Caring Companion and Foster Grandparent opportunities throughout Northwest Minnesota. For more information on how to become a Foster Grandparent, Caring Companion or how to receive Caring Companion Services call Heidi Simmons at 1-800-584-7020. Tri-Valley Opportunity Council, Inc., along with The City of Crookston, The Chamber & Visitors Bureau and the Crookston Early Childhood Initiative presented a viewing of the “Raising of America” (The Signature Hour) Documentary on Wednesday, March 30 at the University of Minnesota Crookston’s Bede Ballroom. 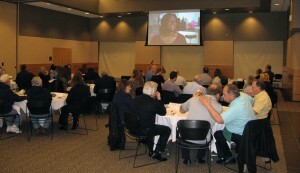 The informational event drew 45 leaders from the area business, government, and early childhood communities. Those in attendance watched the documentary, learned about the U.S. statistics as it relates to poverty, early childhood development, cost and availability of childcare, etc. Following the documentary there was an open discussion based around questions from the video in regards to: We all want what’s best for our children, so why is child well-being in the U.S. so much worse than other rich nations? Why do we allow our most vulnerable children to fall so much further behind the median? How does the squeeze on young families and caregivers—the squeeze for time, money and resources—drip down on infants and young children and alter the wiring of their developing brains with potential long-term consequences? St. Paul, MN – Eight community initiatives with proven results in moving families toward self-sufficiency will receive Best Practices Awards at 2:00 p.m. Wednesday, March 23rd. Minnesota Community Action Partnership, Minnesota Department of Human Services Office of Economic Opportunity, and the University of Minnesota College of Education and Human Development have partnered for the past 11 years to evaluate and to recognize initiatives that aim to end poverty across Minnesota. Minnesota Community Action Partnership is an association of Community Action agencies that offer the last local line of defense for families in need. Cumulatively, Community Action agencies annually serve more than 200,000 low-income Minnesota families with programs such as Head Start, Low Income Heating and Energy Assistance Programs, Weatherization, Jobs & Employment programs, affordable housing development and support, child care, transportation, food support, and senior services. Now that the holidays are over and the winter doldrums are starting to give way to more pleasant weather, are you looking to get more active or find something meaningful to do? If you answered yes, look into volunteering with Tri-Valley Opportunity Council, Inc.’s Senior Programs. Tri-Valley’s Senior Programs consists of the Caring Companion Program and the Foster Grandparent Program. The Caring Companion Program consists of companions who are 50 years or older. They help other seniors by visiting with them, taking them to appointments, helping with errands and groceries, playing cards or games, having coffee with them and being a friend to them. Caring Companions can make a difference in the quality of life for a lonely senior. The Foster Grandparent Program consists of volunteers who are 55 years or older. They volunteer in schools, Head Starts, Developmental Achievement Centers, non-profit day cares and juvenile centers under the supervision of a teacher or childcare professional. They assist children with activities in which they need assistance and mentor children and youth. Volunteering is good for your mind and body. Your role as a volunteer can give you a sense of pride and identity. And the better you feel about yourself, the more likely you are to have a positive view of your life and future goals. Volunteering helps you stay physically healthy and it is especially beneficial in older adults. Mortality rate is lower among volunteers and volunteering has also been shown to lessen symptoms of chronic pain or heart disease. Volunteering can make you happy. Helping others kindles happiness. Research has shown that the good feelings you experience when helping others may be just as important to your health as exercise and a healthy diet. But it’s the smile from a child or thankful person that shows you’re really making a difference in someone’s life. And that’s the greatest feeling in the world. Tri-Valley has Caring Companion and Foster Grandparent opportunities throughout Northwest Minnesota. For more information on how to become a Foster Grandparent, Caring Companion or how to receive Caring Companion Services call Heidi, Jeanette, Jean, Jessica, or Marley at 1-800-584-7020. Crookston, Minn. — The deadline to sign up for health insurance coverage for 2016 is rapidly approaching. Here in Polk, Norman and Marshall counties, Tri-Valley Opportunity Council, Inc. is offering free, in-person assistance. Minnesotans looking to enroll in private health insurance coverage, or change their plan, have until Sunday, January 31, 2016, to enroll in health insurance coverage. Minnesotans eligible for Medical Assistance or MinnesotaCare can enroll year round. MNsure is the only place to qualify for financial assistance to help make premiums more affordable. If assistance is needed in completing the enrollment process, help is available through MNsure-certified assisters – navigators and brokers located in communities around the state. If Minnesotans who don’t qualify for an exemption go without insurance coverage in 2016, they will be subject to a tax penalty of 2.5% of taxable income or $695 per adult ($347.50 per child), whichever is greater. To schedule an appointment for assistance with MNsure please call 1-800-584-7020 and ask for Nancy Ramon or Mitch Bakken. The 2016 open enrollment period began on November 1, 2015, and ends on January 31, 2016. Minnesotans eligible for Medical Assistance or MinnesotaCare can enroll year round. As of May 2014, 95 percent of Minnesotans have health coverage—the highest percentage in state history. 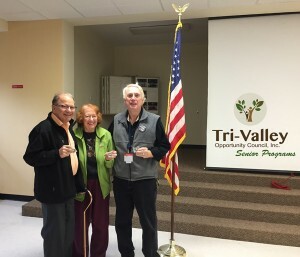 Tri-Valley Opportunity Council, Inc’s. Foster Grandparent Program of NW MN, in partnership with the Corporation for National and Community Service (CNCS), recognized veterans who have continued their service to America as Senior Corps volunteers. The event, held in Crookston on November 6, recognized these dedicated individuals as members of National Veteran Corps, which is part of a larger effort to raise awareness of the value veterans bring to communities. The event is one of nearly 200 ceremonies featuring National Veteran Corps pin presentation taking place across the country throughout the month of November. Gabe, Ron and Dave who are veterans were presented with a special pin, joining thousands of national service members across the country in the National Veterans Corps. They are a part of the Foster Grandparent Program of NW MN. Gabe, Ron and Dave have provided countless hours to children throughout our service area states Heidi Simmons, director of Senior Programs. These three Veterans have been a part of the program for 12, 9, and 7 years respectively, making an impact in over 350 + children’s lives. To be a part of the Foster Grandparent program and add your impact to a child’s life, please contact the Foster Grandparent Program at 1-800-584-7020 or 218-281-5832. Tri-Valley Opportunity Council, Inc. Foster Grandparent and Caring Companion Programs held their annual recognition luncheon at the Crookston Eagles Club on Wednesday, October 7. Heidi Simmons, Senior Programs Director began the event by welcoming the 77 volunteers and guests to the banquet. Jason Carlson, Tri-Valley’s CEO then thanked all of the volunteers for the difference they are making in the lives of others in our communities. Following the welcome, the Starfish Award was given to individuals who have been nominated by teachers or others the volunteer works with. 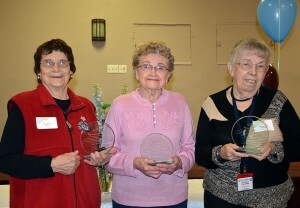 This year there were three recipients of this award from the Foster Grandparent Program. The award is based off the story of an old man who walked up a shore littered with thousands of starfish. It goes: A young man was picking the starfish up and flinging them back into the ocean. “Why do you bother?” the old man scoffed. “You’re not saving enough to make a difference. The young man picked up another starfish and sent it spinning back into the water. “Made a difference to that one,” he said. Recipients of the Starfish Award were Grandma Emojean Anderson who volunteers at Tri-County School in Karlstad and has been a volunteer since 2003, Grandma Bonnie Strand who volunteers at the Win-E-Mac school in Erskine and has been a volunteer since 2009, and Grandma Selma (Sam) Larson who volunteers at Norman County West School in Hendrum and has been a volunteer since 2001. Presenting the awards were Jean Halvorson (Foster Grandparent Coordinator), Jessica Luckow (Senior Programs Coordinator), and Jeanette Larson (Senior Programs Manager). Prior to the meal, the group was entertained by well-known local author Eric Bergeson from Fertile. He spoke on “How to Live to be One Hundred and Three.” Eric spoke of his experiences in dealing with eldercare and his Aunt Olive who he cared for until she passed away recently at 103. Eric also had his most recent book A Treasury of Old Souls: Tending, Befriending and Defending the Elderly displayed. For more information on how to become a Foster Grandparent, Senior Companion or how to receive Caring Companion Services call Heidi, Jeanette, Jean, Jessica, or Marley at 218-281-5832. Mary Johnson, Head Start Assistant Program Design Manager, was presented with the 2015 Champion of Child Safety award on September 24th, 2015 in Vadnais Heights, Minnesota during the seventh annual Minnesota Childhood Injury Summit. Mary was acknowledged for her many accomplishments and long-term dedication in helping protect children from unintentional injuries, with a particular focus on child passenger safety. Mary leads Head Start’s transportation committee, provides CPR, First Aid, and CARS training to our staff and parents, all in order to ensure our TVOC Head Start services are top-notch! Congratulations on this well-deserved honor! Many thanks for your continued leadership in helping to keep children and staff safe in our Head Start programs! Tri-Valley Head Start, Child & Family Programs took a tour to the Owatonna Head Start center, two Migrant camps in Owatonna, and the Elysian Head Start center. The members meet at the Apple Valley Administrative office on Thursday, August 27, 2015 and spent the day learning about our Migrant Head Start families. Members that joined the Tri-Valley staff were Hue Nguyen, Jeanne Dickhausen, Julie Chi, Avisia Whiteman, and Noemi Treviño from Minnesota Department of Education; Dave Snyder and Meghan Holmquist from Minnesota Asset Building Coalition; Haregewoin Tsegaye from Minnesota Department of Human Services; and the President Teresa Luque and Vice President Diana Escamilla from the Migrant and Seasonal Head Start/Early Head Start Policy Council.